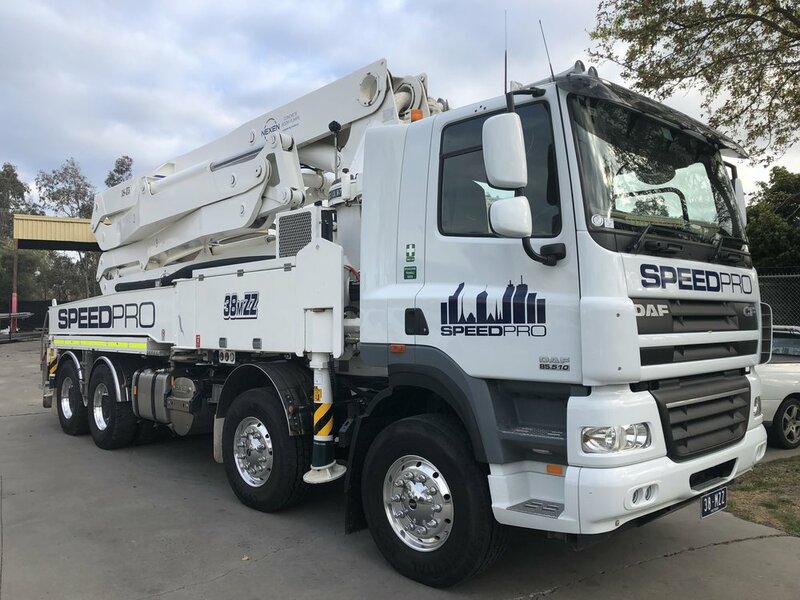 Speedpro welcomes its newest addition to the team - a 38m ZZ Fold Boom Pump! The latest team member to join Speedpro is our 13 tonne Excavator, Welcome! Our crew will be busily working a night shift, currently preparing for a 1,800m2 pour inside Rod Laver Arena. Massive! Speedpro have been awarded the contract for the concrete package from Lend Lease Building for Caroline Springs Shopping Centre Extension. The 7,000m2 extension includes a new Woolworths, tenancies, polished concrete slabs, loading docks, shotcrete retaining walls and suspended mezzanine slabs. Works commence on site in April 2018. Speedpro have commenced work on site for the concrete package for Rosanna Station for the North eastern program Alliance. Our scope includes excavation works, 2,800m2 of ground slabs, exposed aggregate concrete, timber imprinted concrete retaining walls, suspended ramps and concourse and insitu concrete stairs. Speedpro have been awarded the contract for Skye Road retaining walls and abutment package from the North Western Program Alliance. Our works include the excavation, form, reinforce and pour 400lm of retaining wall footings, precast panel installation, stitch pours, abutments, insitu walls and approach slabs. Works commence in a couple of weeks. Speedpro have been awarded the contract for the design and construct of a 12,000m2 PT slab extension to the Heinz Watties facility in Altona with Associated Builders as the main contractor. Other works on this job will include the design and construct of a rail link PT slab, 5,000m2 of external hardstand and loading dock slabs. Speedpro have chosen VSL as our PT contractor. Works commence early February 2018. The last 600m2 is being poured today. A huge thanks to our entire team who have worked tirelessly and who have put in long hours to make this happen, Go Team Speedpro! We joined Movember this year is to “Stop Men Dying Too Young”. We decided to set ourselves the challenge of raising $5000 to help support this great organisation. Over the course of the month we hosted some breakfast BBQ's promoting conversation around Mental health, Suicide prevention, Testicular and Prostate cancer and 'man-ing up' and getting a health check with GP's. We proudly wore Movember T-shirts to celebrate the cause and keep people informed. Our team organised a Family Day Cricket Match with a BBQ and activities for kids, we managed to raise over $1800 on this day alone, it was a great effort! In all, Speedpro proudly raised $6775. We shared stories, found mates who had been through similar situations and connected more as a team. We are looking forward to smashing this budget out of the park next November! Until then, we will partner with Beyond Blue to have an even tighter workforce who feel mentally strong everyday. Speedpro have commenced work on site for the Caulfield to Dandenong Area 3 Superstructure package for Lend Lease Engineering and CPB Contractors. Speedpro’s scope includes the installation of 1,375 precast parapets and form, reinforce and pour over 10,000m2 of new rail track including casting in almost 16,000 rail ferrules.